"I sent out the STUCK OR STALLED email to three different people. I had calls from all three within 2 hours. And each of them apologized for the delays. And guess what? The deals are fired back up again. I can’t thank you enough for this book!" "After reading your book yesterday I sent an email to a large retail buyer who had been avoiding me. Before I woke this morning I had a reply offering a face to face meeting in October. To say I'm impressed with the result is not even close. THE best $20.00 I've ever spent." 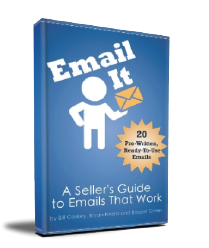 "I have started to supplement my calling with your prospecting emails from EMAIL IT. The responses I have received have been incredible. In fact, the first time I sent one out I landed a meeting! So, thanks to you and Bryan for all of your hard work and all you do for us Sales Professionals!"